Thursday, March 19 police attacked two organizers of the International Peoples Democratic Uhuru Movement during the City Council meeting to feature Mayor Michael Nutter and his introduction of the highly controversial 2010 city budget. During this process, InPDUM members were holding signs protesting Mayor Nutters current budget that spends more than $1 billion a year for police and prisons, which attack the black community. 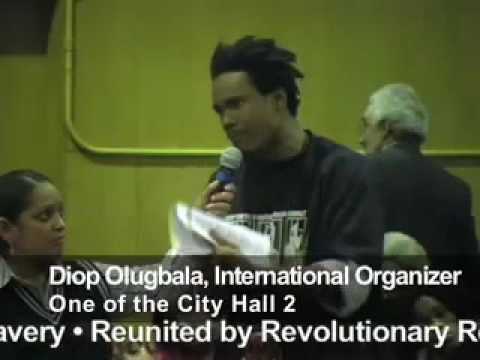 Subsequent to the police attack, InPDUM International Organizer Diop Olugbala (aka Wali Rahman) and InPDUM member Shabaka Mnombatha (aka Franklin Moses)—now known as the Philly City Hall 2—were brutally arrested and now have a list of charges, including aggravated assault on police! As the meeting started, some of the many InPDUM supporters present were holding up signs saying "Unite Philadelphia through Economic and Social Justice, "Jail Killer Police, "Stop the War on the Black Community, and other demands upholding the rights of the impoverished black community. The City Council meeting began with a resolution to recognize the unbeaten Frankford Chargers youth football team. The Chargers were wearing black armbands in memory of their teammate, 14-year-old Sharif Lee Jones, who was murdered by Philadelphia police on August 24, 2008. Civil affairs police gathered behind the InPDUM organizers and demanded they immediately sit down and stop protesting. A Civil Affairs officer put Diop Olugbala into a chokehold. When Diop and the entire audience protested this attack, the police threw Diop and Shabaka down and arrested them. During the violent attack, the police threw at least two elderly people to the ground, and another member of InPDUM, an elderly African woman, was taken to the hospital having suffered a fractured hip. Join the International Peoples Democratic Uhuru Movement Today! Reparations to all the people injured by the police thugs at City Hall on March 19th.